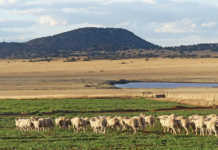 Trientjie and Gerhard Knoetze’s Katryn Merino Landsheep Stud has been named the 2011 SA Studbook Sheep Stud of the Year after only being founded in 2005. 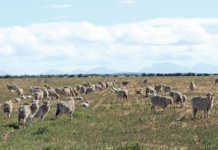 Trientjie and Gerhard Knoetze’s Katryn Merino Landsheep Stud in the Wolmaransstad district was started in 2005 with some 50 ewes and now consists of 500. Gerhard ascribes the stud’s success to hard work, meticulous record keeping, attention to detail and, above all, blessings from the Heavenly Father. “Stud farmers can’t neglect any aspect of their business,” he warns. “You must be precise in all facets and deal with even the smallest matter. Top quality breeding stock is non-negotiable. The enterprise consists of the Merino Landsheep stud, a Bonsmara stud of 300 cows and 700ha planted to maize. 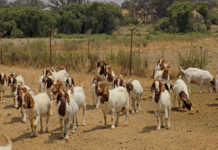 The farm has mainly Hutton soils with vlei areas where the sheep graze. Some 250ha is rainfed Smuts finger grass pasture. Trientjie explains that they decided to branch out into stud breeding as Uitkyk is relatively small, and a stud flock would add more value per hectare than a commercial flock. The Landsheep was developed in Germany in the 13th and 14th centuries from Spanish and French stock, and today constitutes nearly 60% of Germany’s sheep flock. C van der Merwe from Kroonstad imported the first Landsheep into South Africa in 1956. According to the SA Merino Landsheep Breeders Society website, local farmers were astounded by the breed’s exceptional size. Gerhard and Trientjie are passionate about the Landsheep’s qualities. Trientjie stresses, “It’s an exceptional dual purpose and highly economical breed, with a large body and Merino-like wool. Although we tend to favour meat production, the flock still produced 1,4t of 25 micron wool in September. Fertility is non-negotiable in the Katryn stud flock. “The rams run on the veld with the ewes during the day and the flock is kraaled at night to prevent predation and stock theft,” says Gerhard. “Although a good Landsheep ram can work for five to six years, we only use a ram for three years to ensure a high lambing rate. We don’t put rams with their daughters. There are two breeding seasons on Uitkyk – November/December and June/July. The ewes lamb in indoor lambing pens to protect them from predators and the elements, and enable ewe and lamb to bond. “We maintain a very high lambing rate,” says Gerhard. “Triplets are common and quadruplets aren’t unknown. A Landsheep lamb is relatively small and lambing problems are practically unknown to us. This is also when the first selection for potential stud animals takes place, and selected young ewes are put on veld with the ewe flock. Selected young rams are put with the adult rams on veld with a Molatek lick. Young rams that lag behind are culled and marketed locally. The final selection by Landsheep Breeders Society inspectors is at 12 months. The ewes then culled are sold as commercial breeding ewes. Although diseases and parasites are seldom a problem, the stud follows a strict animal health programme. The animals are inoculated once a year after shearing against diseases such as pulpy kidney, Rift Valley fever and blue tongue. Parasites are managed throughout the year as needed. Ticks can be a problem during the rainy season, so sheep are foot-dipped daily. “The high rainfall last year was a problem,” says Gerhard. Contact Trientjie and Gerhard Knoetze on 083 431 4452.